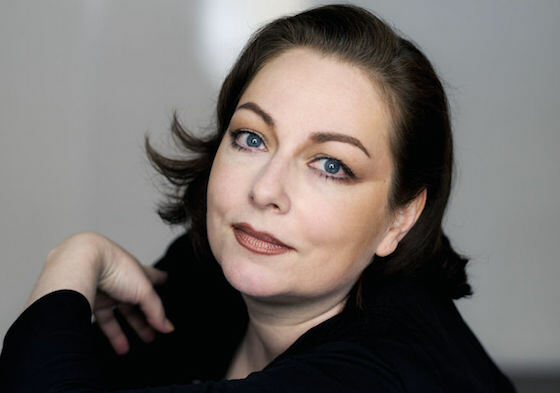 I first encountered the German soprano Dorothea Röschmann through her 2000 recording of Handel's German Arias with the Akademie für Alte Musik Berlin. Her lovely singing in those pieces was aptly described by Richard Wigmore in Grove Music Online as possessing a "clear, silvery tone." She also gave a compelling performance of the aria "Blute nur, du liebes Herz," in Nikolaus Harnoncourt's landmark 2001 recording of Bach's St. Matthew Passion. What I hadn't realized when those recordings were added to my shelf over a decade and a half ago was that Röschmann was already in mid-career. And since then, although she has had a busy opera and concert schedule in Europe and continued to issue recordings, we had lost touch with her. So as we planned to attend her Cal Performances recital Friday night, we wondered whether her voice would show wear and strain from nearly three decades of opera singing. We needn't have worried. From the first notes it was clear that Röschmann was in beautiful voice, retaining all of her silver purity in the higher register. But what had not been clear from recordings is that her voice has developed an especially dark, powerful, almost alto-like lower register. Her low notes can send chills up your spine. Röschmann fully understands that, while loud singing can be dramatic, understatement can be even more effective. Much of the recital was sung in a range between pianissimo and mezzo forte, creating a hushed, inward atmosphere. When occasional fortissimo climaxes did come, revealing a hint of steel in her otherwise lush voice, they were all the more effective for being employed sparingly. Malcom Martineau was Röschmann's superb accompanist; his playing was admirably subtle and he was unafraid to play softly. He supported Röschmann sensitively, and also (particularly during the introductions and endings of the songs) showed that he is a wonderfully expressive musician in his own right. The program was well-chosen to highlight Röschmann's ability to weave a spell. It opened with Schubert's Four Mignon Songs, which set the exquisitely melancholy tone for the evening. Mignon (a character from Goethe's Wilhelm Meister's Apprenticeship) doesn't know her father, and has been abducted from her homeland; in the novel she dies of unrequited love for Wilhelm. Röschmann brought out the character's girlish quality, but also an undercurrent of sadness. These songs were followed by Schubert's solemn "Nachtstück" (Nocturne), in which an old man faces death. "Nachtstück" served as a coda to the Mignon songs; in Goethe's novel, Mignon's unknown father is the elderly harpist who accompanies her, and who ultimately commits suicide out of guilt. The mood lightened with the first two of Mahler's Five Songs on Poems of Friedrich Rückert, a playful "Blicke mir nicht in die Lieder" (Don't peek at my songs!) and a blissful "Ich atmet' einen Linden Duft" (I breathed the gentle fragrance of a linden branch). These were followed by a harrowing "Um Mitternacht" (At midnight), in which Röschmann allowed her voice to become almost guttural as she bit off the consonants of the title phrase. The first half closed with a darkly beautiful reading of "Ich bin der Welt abhanden gekommen" (I am lost to the world) that suspended time. Mich trennt das Boot vom Glück so weit! Des Andern eingedenk zu sein! You, who nurtured me in childhood. The ship will carry me so far from happiness! To remember the other part! The final group was Wagner's Tristan und Isolde-like Wesendonck Lieder. Röschmann sang the radiant "Der Engel" (The angel) ravishingly. Perhaps even more striking, if possible, was her performance of "Im Treibhaus" (In the hothouse), which fully exploited her lower register and achieved a quiet stillness as Martineau's piano suggested the slow dripping of water from the leaves. Magical. As an encore Röschmann performed (I believe) Liszt's "Es muss was Wunderbares sein" (It must be a wonderful thing). This simple and touching song sent us out into the night exhilarated by what we'd experienced. Many thanks to Matías Tarnopolsky, the director of Cal Performances, for bringing Röschmann and Martineau to Berkeley—we hope, not for the last time. Note: On behalf of the audience member whose cell phone rang in the middle of a song because he or she couldn't be bothered to turn it off beforehand; the audience member who compounded the disruption by guffawing at the ringing cell phone; the same audience member, who decided as several songs drew to their hushed conclusions that it was the perfect time to cough; and the audience member (a different one) who, when Martineau announced that the encore was about a couple loving faithfully through life until they are united in death, shrieked with laughter (bitter, are we? )—I want to express my deepest apologies to the artists.